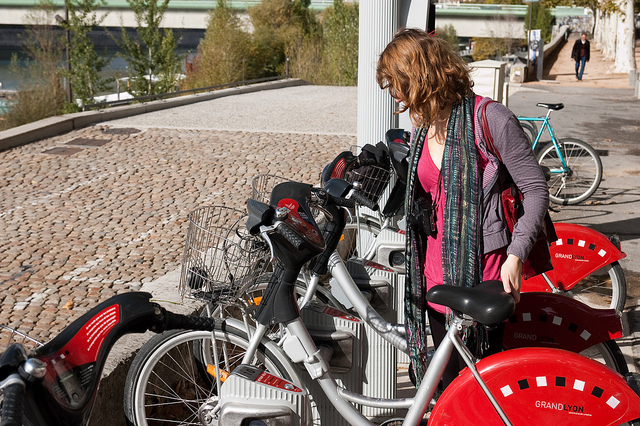 Lyon, France, introduced the most recent “3+” bike-sharing generation. Photo by juicebox013. Looking back at Amit Bhatt’s presentation on Financially Sustainable Public Bike-Sharing at Transforming Transportation 2013, I thought I would share with you the key moments and generations in the history of bike-sharing. Although it appears like a new trend, bike-sharing dates back to 1965 and has already gone through three generations over the course of the past forty-eight years. The number of cities with bike-sharing has quadrupled in the past five years, with 204 cities today. China’s 27th most populous city, Wuxi, now has 70,000 bikes in its bike-sharing system. Bike-sharing is a great way to get people back on bikes: 84% of the bike-sharing users in Gangzhou, China had never biked in the city before. The first generation of bike-sharing started in the summer of 1965 in Amsterdam. Amsterdam’s distinct “White Bicycles,” were in free circulation; bikers were supposed to use them for one trip and then leave them unlocked for someone else to use. The White Bicycle Plan was the world’s first demonstration of a bike-sharing program and provided increased mobility to Amsterdam dwellers. Copenhagen, Denmark introduced the second generation of bike-sharing and brought it to scale with several thousand bikes under the name “Bycykler København.” The introduction of the locking system at specific stations – bikers would use a coin-deposit – answered the need to deter theft and incentivized bicycle return. The system was free since a coin was refunded when you returned the bike. In 1998, Rennes, France, launched “Vélos à la carte,” introducing the third-generation of bike-sharing replacing coin-access with smart card access. The third-generation also started the now popular scheme of 30 minutes of bike use for free. The use of a smart card answered the need for real-time information for the operator, and started the use of technology to assist in re-balancing the bikes between different stations. In 2005, the city of Lyon, France, introduced “Lyon Vélo’v,” with bikes equipped with electronic components allowing for the bike to be identified by the stations, the distance traveled and conditions of the bikes (lights, dynamo, brakes, etc.) to be tracked, and detailed statistics about bike usage collected. Other cities such as Knoxville, Tennessee and San Francisco have also begun introducing electric bikes. This third generation “plus,” signaled the appearance of flexible, clean docking stations, touchscreen kiosks, additional bike re-balancing technologies, as well as the integration of one unique card allowing a user to ride both bikes and public transportation. Many of the major innovations in the history of bike-sharing occurred in Europe, but today bike-sharing exists on six continents. What innovations do you expect today from bike-sharing in your city? Leave your comments below this blog post, or find us on Facebook.